A comprehensive guide to making pizza, covering nine different regional styles--including standards like Neopolitan, Roman, and Chicago, as well as renowned pizza sub-specialties like St. Louis and Californian--from chef, 11-time world Pizza Champion, and Guinness world record-holding pizza-spinner, Tony Gemignani. Pizza is one of the world's most well-known and beloved foods, and everyone has their favorite style. In fact, devotion to one particular style is so ubiquitous that most pizza books only cover one or two varieties of pie. But for those who truly love pizza, there's no need to be monogamous. Pizza master Tony Gemignani brings pizza to the people in all its glorious forms, from Chicago deep dish to paper-thin Roman style. 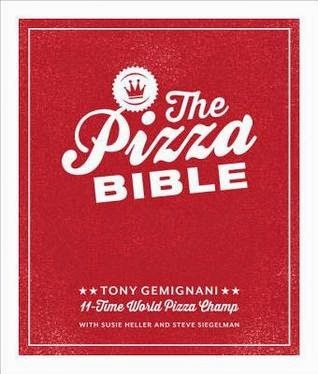 "The Pizza Bible" is the world's first guide to making all of the major pizza styles, filling a hole in the market and elevating the craft of making pizza to that of bread or charcuterie. Ever since I realized that you could make pizza at home, I've enjoyed experimenting with different styles and ingredients. So, when I saw that this book was available, I jumped at it. After all, this book probably holds the secrets to amazing pizza...The book itself is sturdy and doesn't come with a dust jacket, which I appreciated. In my kitchen, dust jackets end up torn and smudged because my cookbooks sit right on the counter where I'm cooking. The book includes sections on the science of pizza making and the importance of quality ingredients. That's about where the book lost me. There wasn't a single recipe in this book that I could try with the ingredients on hand. In fact, quite a few ingredients would have had to been custom ordered online because they're not ones that the average grocery store even carries. Did I mention that he insists you only cook on pizza stones and not one, but two and use a peel to move the pizzas in and out of the oven? For what it would have cost me to attempt a single recipe, I could have ordered pizza for my family multiple times. So, here's my recommendation...if you want to become a professional pizza chef or have the time (the dough recipe alone takes three days!) and the money to experiment, absolutely buy this book. You're going to love it. If you're a busy mom just looking for some new ideas for pizza night, this book isn't for you.